Paolo G. Carozza, professor of law, concurrent professor of political science and director of the Kellogg Institute for International Studies at the University of Notre Dame, has been appointed to the Pontifical Academy of Social Sciences by Pope Francis. Established by Saint Pope John Paul II in 1994, the Pontifical Academy of Social Sciences promotes such social sciences as economics, sociology, law and political science, and makes studies in them available to the Church for the development of social doctrine and the application of that doctrine in contemporary society. An international body composed of 25 scholars, the academy includes another Notre Dame faculty member, Vittorio Hösle, Paul Kimball Professor of Arts and Letters. 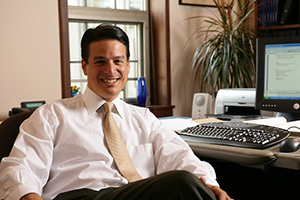 Carozza joined the Notre Dame faculty in 1996. His expertise is in the areas of comparative constitutional law, human rights, law and development and international law. His writings in these areas have been published in Europe and Latin America as well as in the United States. At Notre Dame, in addition to directing the Kellogg Institute, a component of the new Keough School of Global Affairs, Carozza is a fellow of the Kroc Institute for International Peace Studies, the Nanovic Institute for European Studies, the Liu Institute for Asia and Asian Studies and the Institute for Educational Initiatives. In the Notre Dame Law School, he directed the Center for Civil and Human Rights from 2011 to 2013 and directed its J.S.D. in International Human Rights Law program from 2006 to 2016. From 2006 to 2010 he was a member of the Inter-American Commission on Human Rights and served as its president in 2008-09. In 2009 he received the Order of Merit of Bernardo O’Higgins, the Republic of Chile’s highest state honor awarded to foreign citizens, in recognition of his service to the Inter-American human rights system. A 1985 Harvard College graduate, Carozza pursued graduate studies at Cambridge University and at Harvard Law School, from which he earned his Juris Doctor in 1989. He has been a visiting professor at universities in the United States, Europe and Latin America, including as the John Harvey Gregory Lecturer on World Organization at Harvard Law School and twice as a Fulbright senior scholar. Originally published by Michael O. Garvey at news.nd.edu on August 08, 2016.